If you thought that AK was the only non-vegetable-eating man in my life, you are sadly mistaken. And before you get any ideas, I’m referring to my brother Adit. Growing up, he was the odd one out in our family. Always chicken-hungry, racing in the opposite direction from the ghiya-tori-tinda-baingan that we all loved, he was such a painfully picky eater. But ever since he moved away to Switzerland, he has discovered a new love for all the simple vegetarian food that we made at home, often making frantic calls and exchanging panicked texts with me over recipes. Cliched, I know. Can you believe that he even misses my mom’s dal-ghiya sabzi?! I had to kick myself to ensure I wasn’t dreaming when he first called for vegetarian recipes! 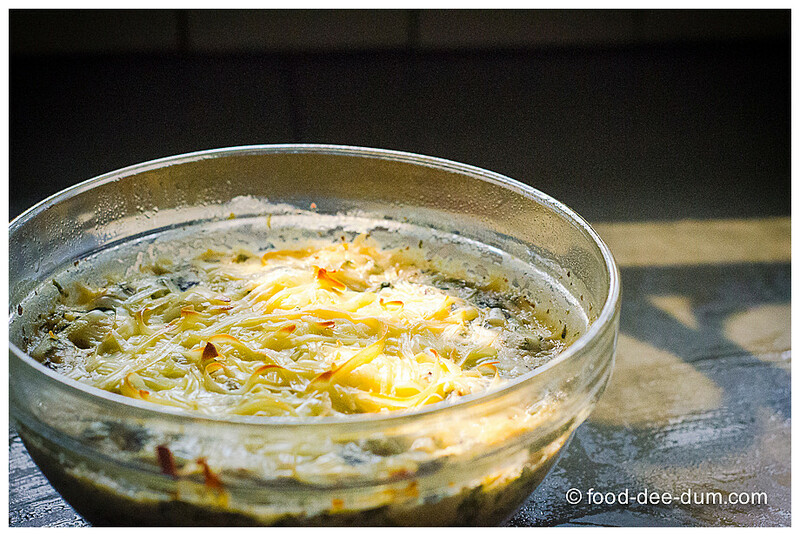 His latest craving was for these Baked Vegetables in White Sauce (ok bechamel, if you want to be fancy) that my mom and I made all the time. 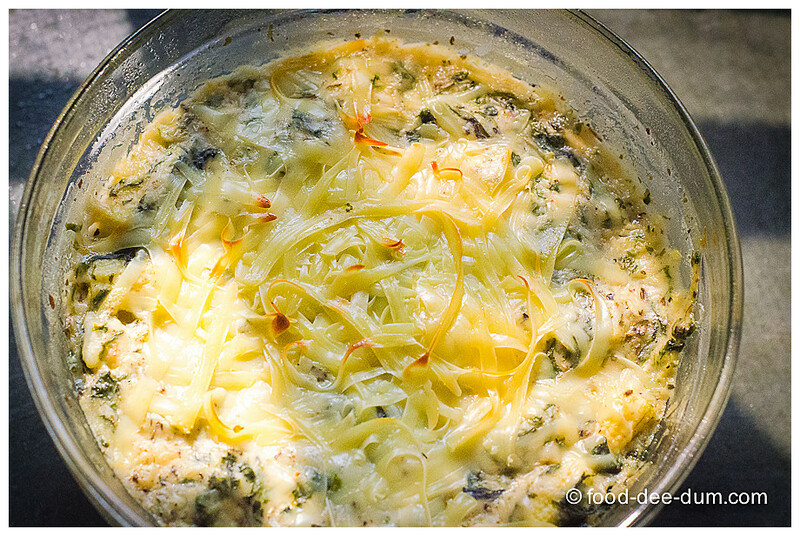 After sending him the recipe and helping him make it long-distance, I wondered why I hadn’t blogged it yet. It’s such a favourite and so adaptable, that I had to make it for myself again! First, I turned on the oven to pre-heat at 150 C while I got everything else ready. 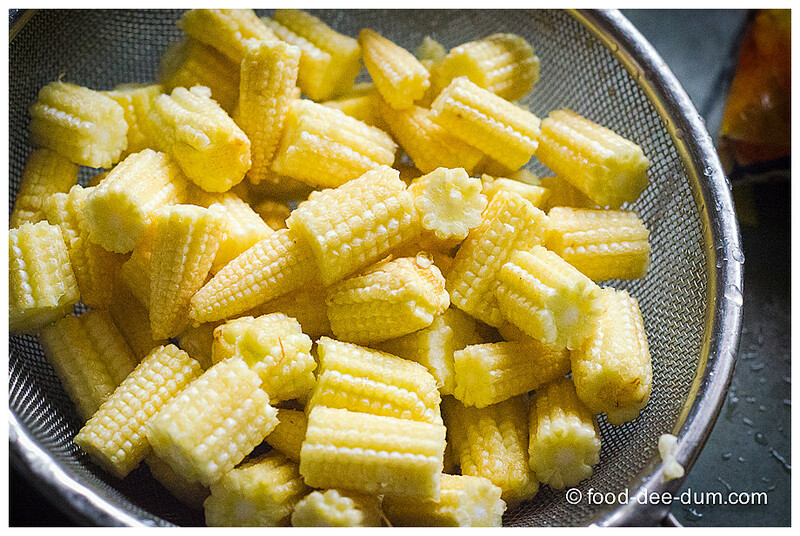 I washed the baby corn and let it drain for a few minutes. I cut them into bite sized pieces – about 3-4 pieces from each – and de-frosted my frozen boiled spinach. 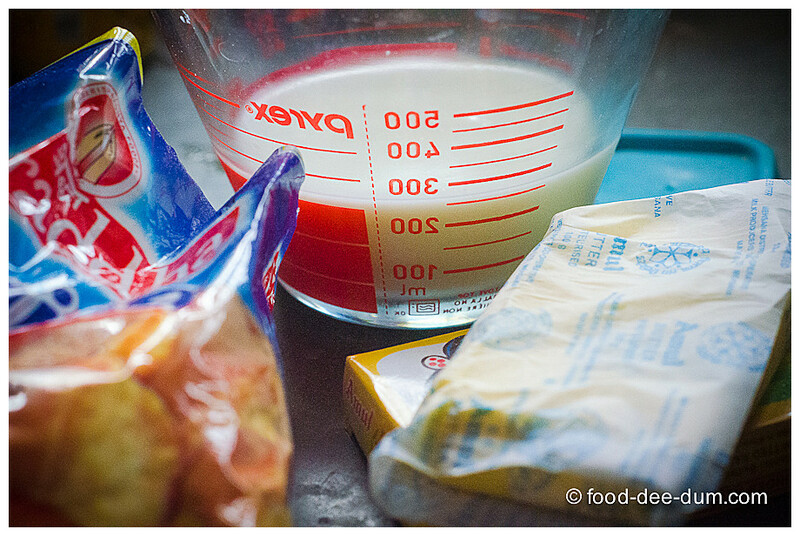 Before proceeding to make the sauce, I measured out the butter, flour and milk and kept them ready and at hand. 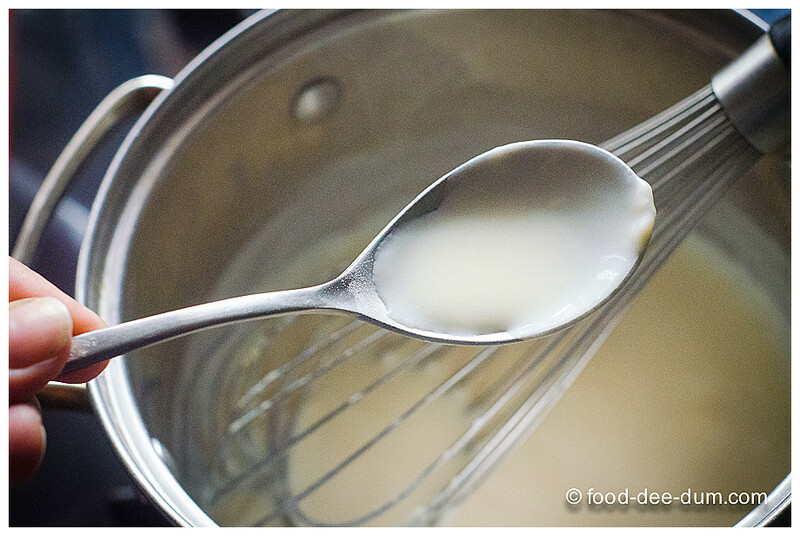 Making the white sauce is not a complicated or long process but a little bit of caution and attention goes a long way! 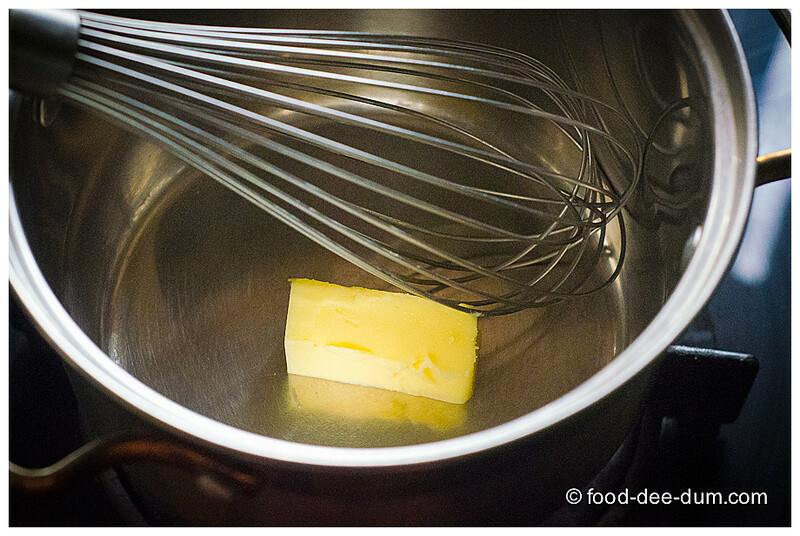 I placed the butter in a heavy bottomed saucepan and set it to melt on medium heat. Notice the whisk? 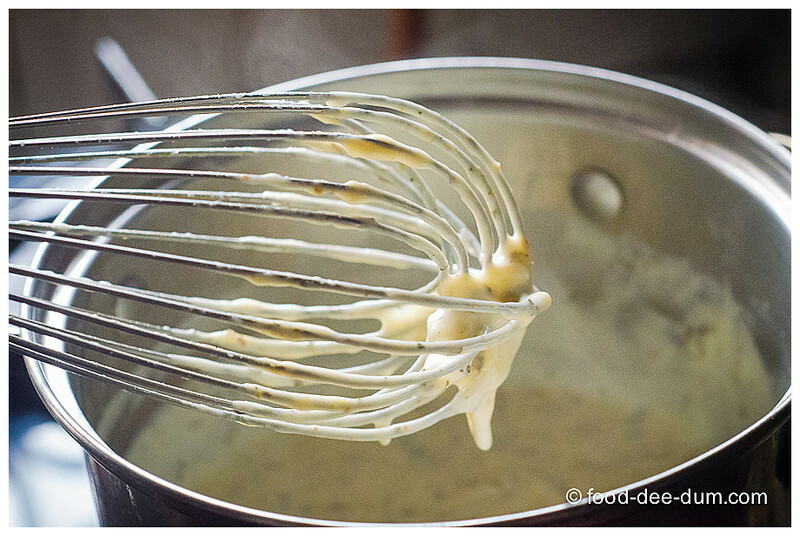 It’s my best friend when I make this sauce — helps me avoid lumps and make a nice smooth sauce. 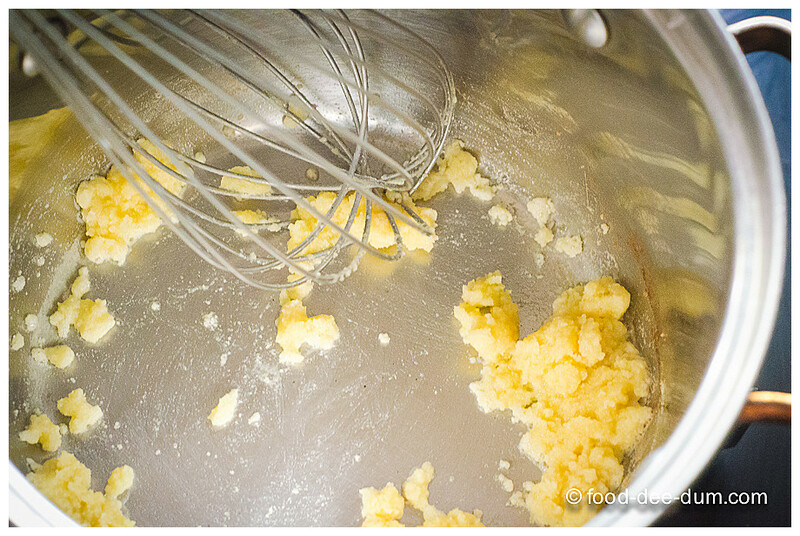 As soon as it melted, I tossed in the flour and used the whisk to continuously stir it around. 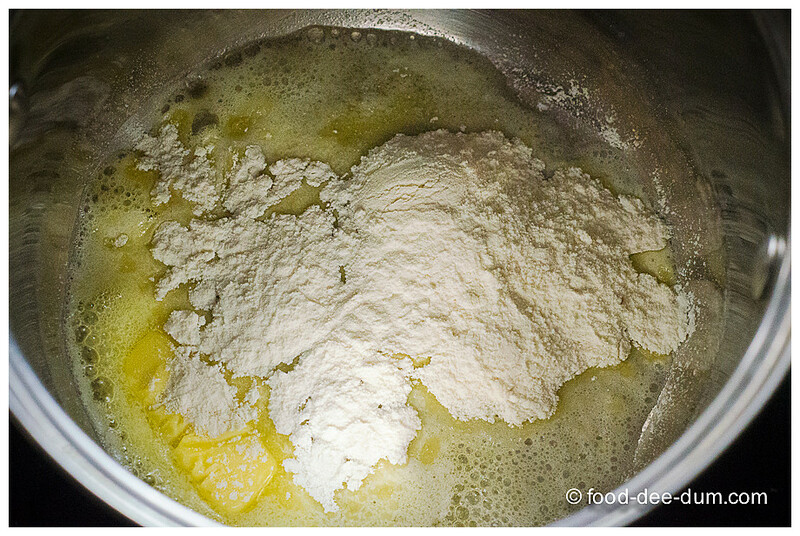 I continued to roast the butter flour mix, stirring continuously, until it lost the raw smell and turned a shade darker. 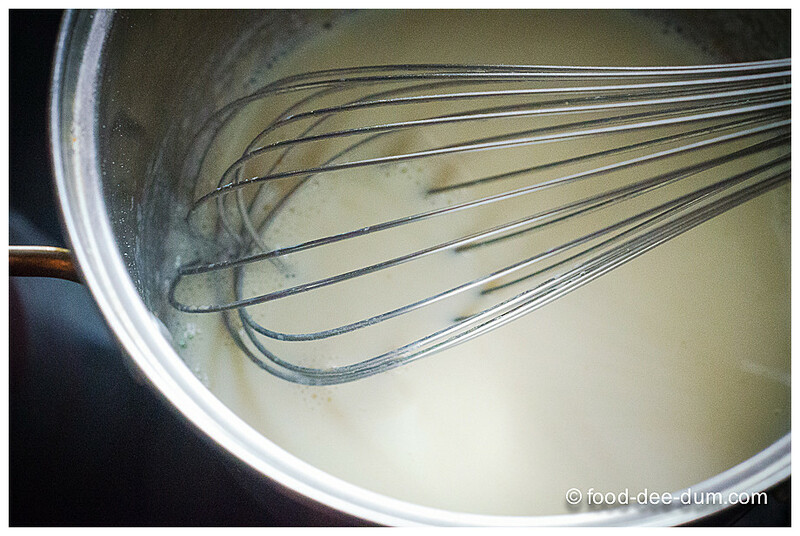 I poured the milk in a slow, steady trickle – whisking all the time to avoid lumps. 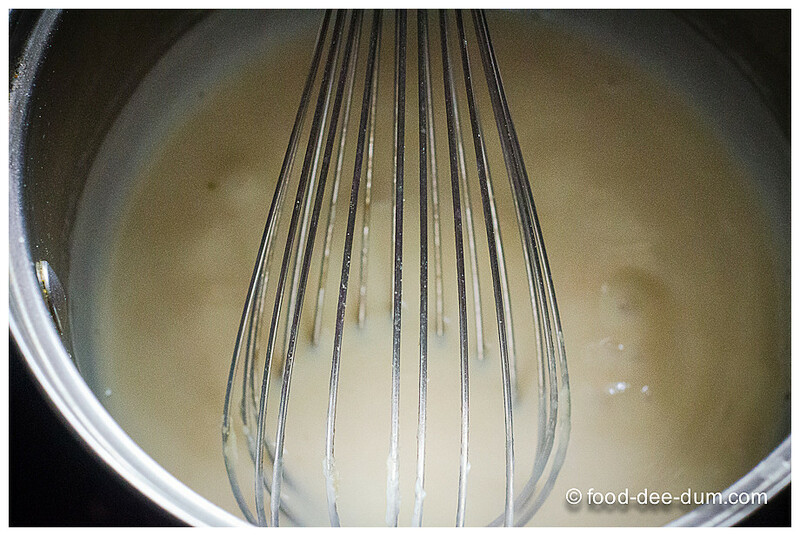 Once I was certain that there were no lumps, I increased the heat slightly and allowed it to come to a boil, whisking continuously. Once it came to boil and was thick enough to coat a spoon, I turned off the heat. 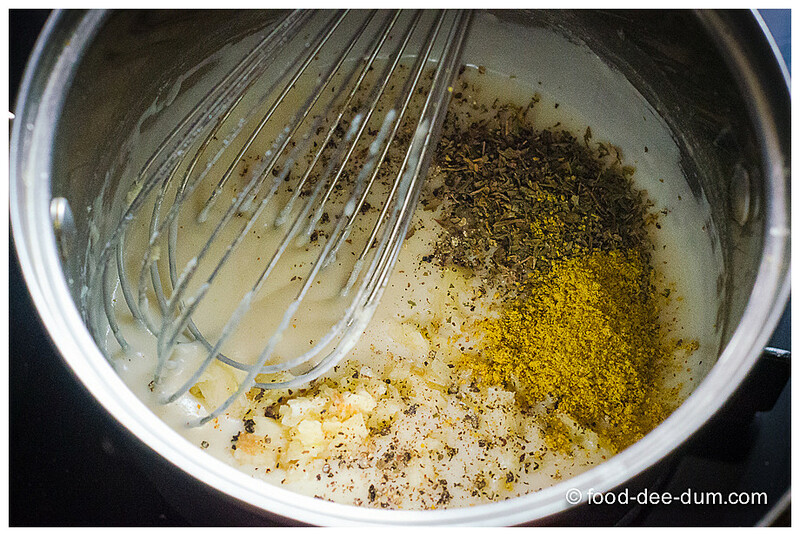 I added the salt, pepper, garlic, mustard and herbs and stirred it to combine. As you can see, the sauce gets thicker as it cools. 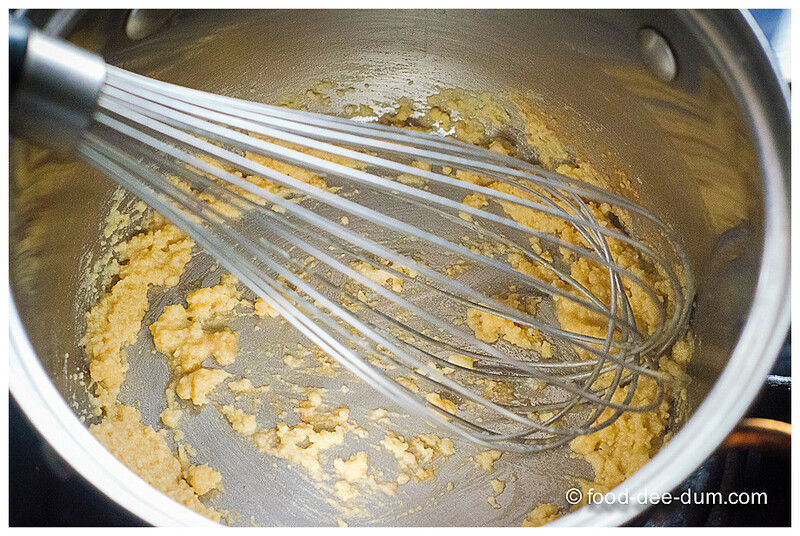 I tasted it and adjusted the seasoning before retiring the whisk. 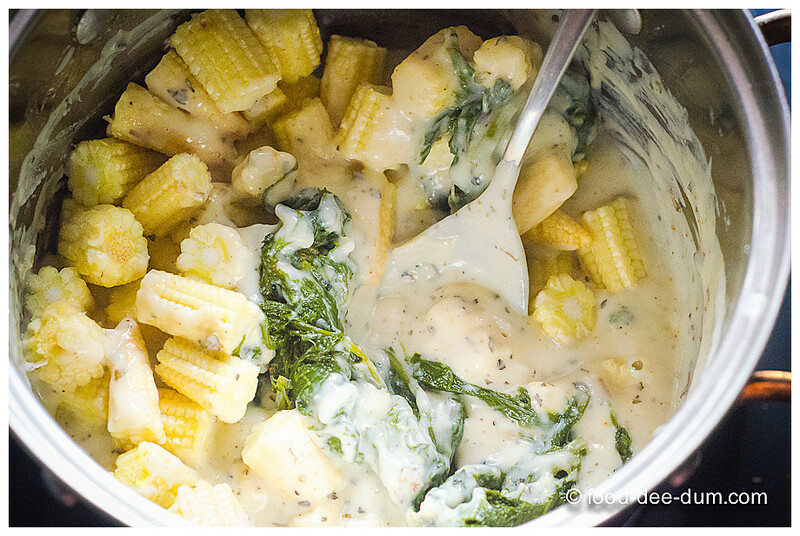 Adding in the babycorn and spinach, I stirred the mixture till the veggies were evenly coated with the sauce. 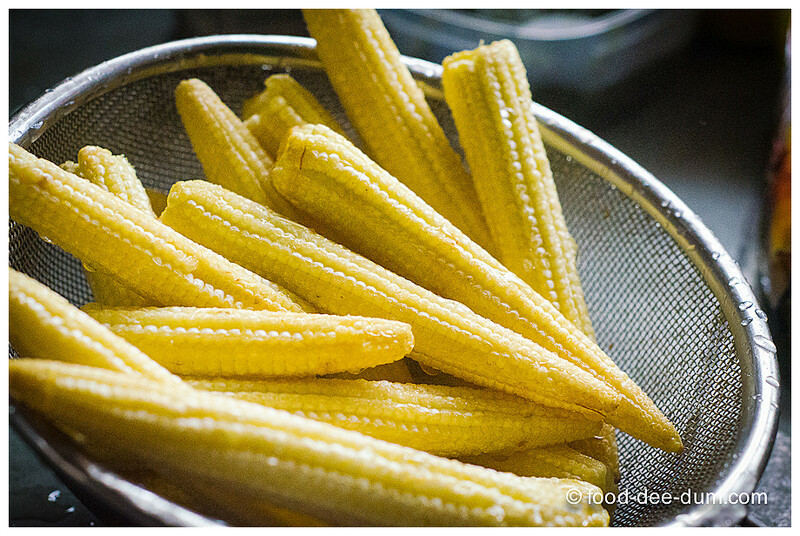 (As an after-thought, I should have blanched the baby corn in boiling water for 1-2 minutes to soften it a little bit). Transferring the mixture to a greased ovenproof bowl, I sprinkled on the grated cheese before popping it in the oven for about 20 minutes. 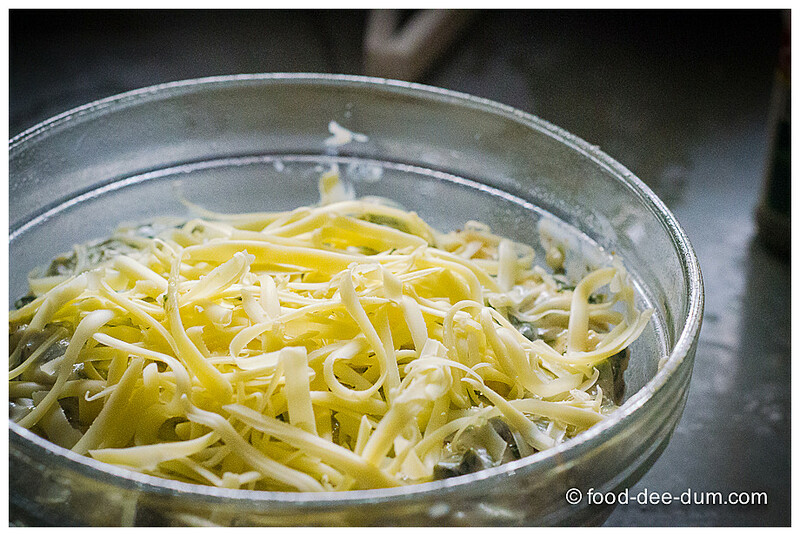 Turning on the top coil for about 3-4 minutes in the end allowed some of the cheese to brown. I let it rest for 5-7 minutes before I served it up along with a lettuce salad and a beetroot-peanut salad! It was a veggie-heavy lunch with a only a potato & bacon fritata to save poor AK! The basic sauce is mainly a combination of butter, flour and milk and can be flavoured/ seasoned to your liking or according to what you plan to put in it. It is a good base to bake many types of dishes – pasta, meats, vegetables. I chose to use baby corn and spinach this time but you can use any combination of any veggies you like — broccoli, beans, carrots, corn or anything else you fancy. Avoid veggies which have a high water content (like mushrooms) which would release a lot of water while baking and ruin the dish. If you must put some vegetables like that, then saute or half-cook them in advance to ensure that they release most of the water BEFORE it gets mixed with the sauce. If you use slightly tough vegetables like beans, which may not cook to the desired tenderness in 20-25 minutes of baking, blanch them quickly in boiling water for 1-2 minutes, drain and rinse with cold water before mixing them with the sauce.